Stunning aerial views of shuttles Atlantis and Endeavour perched atop launch pads 39A and 39B on Sept. 20. For its role as a rescue craft during the Hubble servicing mission and the scheduled November logistics run to the space station, Endeavour is moved to the Vehicle Assembly Building. Shuttle Atlantis makes the slow journey from the Vehicle Assembly Building to launch pad 39A for the STS-125 mission to service Hubble. Soyuz commander Yury Lonchakov and his two crewmates, NASA astronaut Mike Fincke and space tourist Richard Garriott, docked with the international space station Tuesday to close out a two-day orbital chase. The Soyuz TMA-13 spacecraft docked at the central Zarya module's downward facing port at 4:26 a.m. EDT as the two spacecraft sailed 215 miles above Kazakhstan. 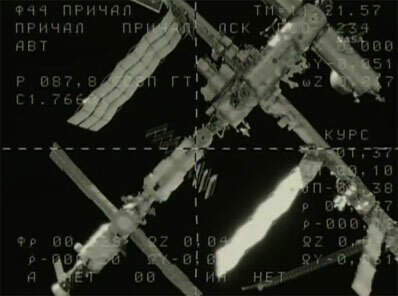 "We have capture, we have indicated capture," a Russian translator reported as the small capsule's docking system engaged its counterpart on the station. Video from the space station showed the Soyuz TMA-13 vehicle slowly approaching and then gently bumping into the docking port. A few moments later, hooks and latches closed, damping out residual motion and firmly locking the two spacecraft together. After about an hour and a half of leak checks, hatches were opened and the Soyuz crew floated into the station. Fincke, Lonchakov, Garriott and the station's Expedition 17 crew - commander Sergey Volkov, Oleg Kononenko and Gregory Chamitoff - gathered in the Zvezda command module a few moments later for a teleconference with family members, along with U.S. and Russian space officials in mission control near Moscow. "Welcome to your new home," Kirk Shireman, deputy manager of NASA's space station program, radioed. "We wish you all the best and look forward to seeing you either at home in a few days or in six months. So congratulations." Fincke will replace Volkov while Lonchakov will take over flight engineer duties from Kononenko. Volkov, Kononenko and Garriott plan to return to Earth on Oct. 23 aboard the Soyuz TMA-12 spacecraft that carried the two cosmonauts into orbit last April. The station's third crew member, NASA flight engineer Gregory Chamitoff, will remain aboard the lab complex with Fincke and Lonchakov as part of the Expedition 18 crew until his own replacement, Sandra Magnus, arrives next month aboard the shuttle Endeavour." Garriott, a computer game designer and son of former shuttle astronaut Owen Garriott, paid the Russians some $30 million for a visit to the space station. He is the sixth person to book a commercial flight to the station through Space Adventures Ltd.
Volkov, son of Russian cosmonaut Alexander Volkov, is the first second-generation space flier. Garriott is the first second-generation American to fly in space. Both fathers were present at a post-docking news conference at Russian mission control near Moscow. "I unwillingly had tears in my eyes," Volkov said. "Not so long ago, waking up one day in the morning, I thought to myself, 'why not fly to space one more time?' Just kind of came to me on a whim. So if the team makes that decision, I'm ready to make another spaceflight." Owen Garriott, sitting to Volkov's right, said "perhaps we are not old enough yet!" "Many thanks to Roskosmos, Energia and all the contractors who made this beautiful flight possible," Garriott said. "We look forward to completion in another 10 days and thank you all very much." During the post-docking teleconference, Alexander Volkov radioed congratulations to the station and Soyuz crews gathered in the Zvezda module. "Congratulations to all of you," he said. "Congratulations to the crew that just arrived on board the space station. We're glad to see all of you together after the new crew spent two days in the coldness and the crowdedness of the Soyuz capsule. Congratulations on your meeting in space and I wish you all the best." Fincke's wife and three children also were on hand. "We're very proud of you, we're proud of the entire crew and we love you very much and hope you have a great mission," Renita Fincke radioed. "Chandra wants to say hi." "Hi dad," Fincke's seven-year-old son called. "Hi dad." "Hi, Chandra. I'm very happy to hear you and I'm very happy to hear your mom. I love you and I love your sisters very, very much. And I love your mom so much. I'm glad to be here. Thanks for letting me come to space station. I'm doing great." After Fincke's mother and father said hello, Owen Garriott radioed "congratulations to the (Soyuz) crew. We saw your entry, you've done well and we're looking forward to 10 more days of Richard." "Hi, Peter Pan," someone else in the Garriott party radioed. "Ah, very good, thank you Pop," Garriott replied from space. "Hey thanks, I can fly!" "You can fly. Peter Pan is on the space station! I love you." Over the next 10 days, Volkov, Kononenko and Chamitoff will brief Fincke and Lonchakov on the intricacies of station operation. Fincke spent six months aboard the lab in 2004 as a flight engineer and Lonchakov made two short-duration visits in 2001 and 2002. But the station has grown considerably since then with the addition of European, Japanese and American modules. "It'll be easier for him to come on board for the second time," Chamitoff said of Fincke. "I won't have to worry about showing him all the ropes, he'll know most of everything. But since he was here, we've added many modules to the space station. Everything behind me, actually, is brand new since he was here. Two spectacular laboratories. ... So there's a lot to show him, how we do everything and what's going on in those laboratory. There's plenty of us to talk about." In a pre-launch interview, Fincke said serving as commander brought a different set of challenges. "The first time around, I really focused on doing my own job correctly," he said. "And now I'm asked to play a slightly bigger picture role to make sure everything's going smoothly for all my colleagues, who are extremely well trained and extremely competent. But this way, I can help smooth over any bumps along the way in operations and guarantee NASA and all our international partners a good and safe mission. it's definitely a different way of looking at things. ... Being a space station commander definitely does not come with a manual."